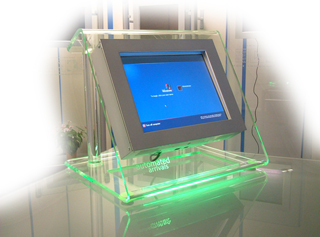 i-Touch V22 Glass Desk Top Kiosk with 15'' screen - Future Generation Kiosk Products. The motherboard offers USB, Serial, Parallel and PS2 Keyboard and Mouse I/O ports. The lower peripheral cover is lockable to prevent unauthorised access. Its most important feature is that it's a portable self-contained designed for the desktop operation. - Dimensions: 500x420x300 mm (WxHxD). Weight: 15kg.